About this object James Beauchamp Clark of Missouri served four terms as Speaker of the House and three terms as Minority Leader. 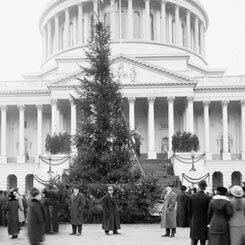 Democrats controlled the 63rd Congress (1913–1915) after sweeping the 1912 elections. President Woodrow Wilson implemented a long-held belief that the executive should be the nation’s legislative leader. He revived the original practice of addressing Congress in person and shepherded major legislation to passage: tariff and anti-trust reform, the creation of the Federal Reserve System, and the establishment of the Federal Trade Commission. The outbreak of World War I in Europe, though, threatened the future of reform. 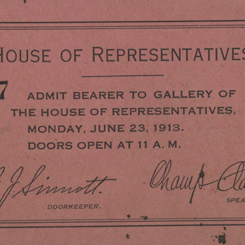 Representative Samuel W. Smith of Michigan put a parliamentary question to Speaker James “Champ” Clark of Missouri.